The #7 Mountain Brook Spartans travel to play the #2 Hewitt-Trussville Huskies at Hewitt-Trussville Stadium on Friday night. Both teams are 4-0 in Class 7A, Region 3 and are headed for the playoffs, but the winner will take a big step towards that region crown. 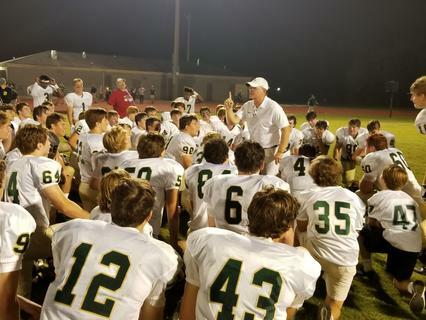 Mountain Brook (6-0, 4-0) is coming off a big defensive win over Oak Mountain (21-0) while Hewitt-Trussville comes off a win over Vestavia Hills (41-6). The Mountain Brook defense is only given up 7.0 points per game with three shutouts. The Hewitt-Trussville defense has given up only 10.2 points per game over the last four games, but the Huskies have the high powered offense while the Spartans want to grind out the drives and keep the ball away from their opponent. Mountain Brook had to replace eight starters off of the 2017 team on offense and have been improving each week to this point of the season. "Some times youth can give you energy, but we are very inexperienced on offense" said Spartans head coach Chris Yeager. "The competition has got progressively tougher and we have progressively improved on offense each week. Our schedule demands us to get better each week. That has been a pleasant thing to happen watching the progress." At quarterback is sophomore Strother Gibbs leading the Spartans offense. For the Spartans at running back is AJ Gates and Daniel Wilbanks. Gates can shift it in any gear and run around you in a quick second while Wilbanks is the hammer that likes to run north and south. "AJ is our shake and bake type guy," said Yeager. "Daniel is our downhill runner. You have to play physical in this region if you want to win on Friday nights." Add Sam Higgins in the mix to keep the fresh legs for the Spartans. Even though Gates and Wilbanks rotate in don't be surprised to see them both on the field at the same time in different packages from the Spartans. Wilbanks came out of the with a foot injury and didn't return in the second half last week against Oak Mountain so we will see how he does coming off that injury. At receiver Hamp Greene brings a lot of experience at receiver. Bring in Crawford Golden, Pierce Rodrigues, Blake Roth and William Miller round out the Spartans at receivers. Greene is a valuable weapon on returning punts this season for the Spartans. On the offensive line, coach Yeager is one of the best in the state in getting lineman ready to play. Andrew Fleming, Hugh Lawson, Hayden McDonald, John Wetzler and Michael Muncuso round out the offensive line. The strength of the defense is at linebacker. Colton Yeager made it back against Oak Mountain last week after being out two weeks before that game. Linebacker Clark Griffin and Edward Cain have played really well this season for the Spartans. They will need to be healthy for the stretch drive with upcoming games with Hewitt-Trussville, Thompson and Hoover on the horizon. Griffin stands at 5-foot-5 and 175 pounds and has been very consistent all season. "Colton being a coaches son and for his love of the game has been really good," added Yeager. "Clark is probably one of our leading tacklers. The defensive front has played extremely well this season." In the secondary, Alex Washington (recent Air Force offer), Grant Griffin, Robert Reed and Autrey Baynes lead the way for the Spartans. The Mountain Brook secondary will have their hands full this week against Hewitt-Trussville. Washington and Baynes had interceptions last week against Oak Mountain. For Hewitt-Trussville (6-1, 4-0), they have one of the best quarterbacks in the state in Paul Tyson. The Alabama commit has completed 139-of-196 passing for 1,982 yards with 20 touchdowns and 2 interceptions through the seven games of the season. He stands behind one of the best offensive lines in the state that has the best offensive lineman in the state in Pierce Quick. The 6-foot-7 285-pound lineman is another Alabama commit that the Huskies have and is a dominate offensive lineman along being a four-year starter. "He is a smart football player that knows the game and understands his job," said Huskies head coach Josh Floyd. "He is a punishing blocker and it doesn't matter if it is running blocking or pass blocking. He is so physical and he is a guy that can run for his size that can make blocks 20-yards down field. There is not a lot of guys his size that can do that and he is one of the best lineman in the country and going to Alabama." The offensive line has some good ones besides Quick. Cooper McManic, Miller Malone, Jonathan Moore, Tyler Carter and Logan Self all contribute for the Huskies. "We weren't healthy early in the season on the line," added Floyd. "We have a couple out during the spring along with our center in the summer time. Early on we were looking for them to gell together and get more reps together. We are fortunate to have two guys to rotate in so we look to seven guys as starters." At running back behind this big offensive line is Armoni Goodwin (soph), Cameron Bledsoe (senior) and Sean Jackson (soph). Goodwin has 932 yards on 129 carries for a whopping 7.2 yard per carry average along with 10 touchdowns. Jackson has 191 on only 23 carries for a 8.3 yards per carry and add 118 yards receiving on 10 catches and one touchdown. Coach Floyd says he might have the best hands on the team catching the football. Bledsoe has 181 yards on 43 carries and two touchdowns. The receivers are very good with Ja'Varrius Johnson and Dazalin Worsham. Johnson (an Auburn commit) has 964 receiving yards on 48 receptions and nine touchdowns. Worsham (Alabama commit) has 674 receiving yards on 58 catches and eight touchdowns on the season. On the Huskies defense, they have been getting better each week especially in region play. "Our kids believe in what we do and we did struggle early in the season," said Floyd. "But we are staying the course and we have made a few personnel changes from the standpoint of getting some older players on the field. Were trying to get the best 11 on the field. A few seniors have stepped up." A couple of leaders that have made a difference on defense have been Tyler Antkowiak (66 tackles), Brayden Berguson, and Creed Parker (65 tackles) this last month on defense. Trey Washington and Malachi Moore will need to be tight on Greene of the Spartans. "Mountain Brook plays very well on defense," said Floyd. "They do a great job of mixing up coverages and fronts on that side of the ball. Good tacklers that get to the ball carrier. They have weapons on offense with Gates and Greene. We have to limit the big plays and be able to score on offense. We have to protect the football and have done a pretty good job of that and we need to force some turnovers. There running backs are scary. It's going to be a physical ballgame."